Maybe all-you-can-eat Korean barbecue wasn’t born in Southern California, but it probably should have been. The confluence of significant ex-pat Korean communities and peculiarly American attitudes toward food that gave rise to AYCEs in the first place probably made it a question of when, not if. While AYCE belongs to the here and now, Korean barbecue stems from a different day, age and place. It’s a juxtaposition felt in every bite: a very old taste in a totally new context. The roots of Korean barbecue trace to the Koguryo Kingdom (37 BC to 668 AD), after the invasion of Korea by the Manchurian Maek tribe, who brought with them a dish—maekjeok—that was seasoned before roasting rather than afterward. After falling out of favor when Buddhists (and vegetarian diets) took over Korea, the invading Mongols brought back maekjeok, which evolved into neobiani, featuring thinner cuts of meat. Neobiani would be recognizable to those familiar with bulgogi (the popular dish of grilled beef in a sweet soy-and-garlic marinade). Modern Korean barbecue is grilled meat, often treated to a variety of marinades (sweet, spicy or salty). While beef is king, Korean-barbecue restaurants usually offer pork, chicken and seafood options, too. 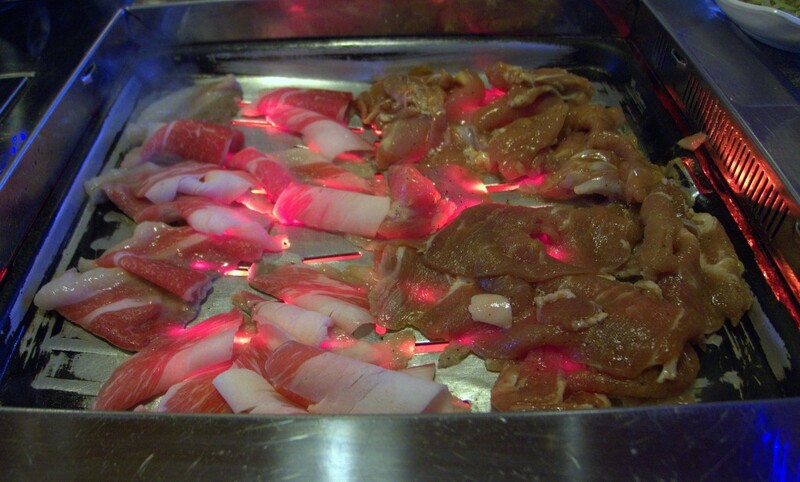 Guests usually cook the meat themselves on grills built into the tables. The popularity of Korean barbecue no doubt derives from our deep, essential, elemental connection to meat and fire. The familiarity of the sweet, spicy and garlicky flavors enhance Korean barbecueís accessibility. Unfortunately, the usual price tag does otherwise. Korean barbecue is expensive. The best, like Dae Jang Keum (7905 Engineer Road in Kearny Mesa), could easily set you back $75 for two. The AYCE-Korean-barbecue concept addresses this, but the best of these are still not exactly cheap. Manna Korean BBQ (4428 Convoy St. in Kearny Mesa) is excellent but still costs $24.99 per person. Roadem BBQ (4344 Convoy St., again in Kearny Mesa) offers a less-expensive way to try Korean barbecue. Its AYCE lunch special costs a more reasonable $10.99 per person. The choices aren’t as numerous as at Manna—or Roadem’s own dinner menu (available at lunch for $14.99 or, with premium options, $19.99)—but beef, pork and chicken are on the lunch menu. Particularly tasty lunch selections at Roadem are the brisket, spicy pork, sweet marinated pork and pork belly, all good quality and all accompanied by banchan, a wonderful array of small dishes, including the familiar kimchi, and similar dishes with daikon radishes, bean sprouts, cucumbers, scallions, seaweeds, potatoes, fishcakes and pancakes. Roadem’s banchan are exceptionally, intensely flavorful. Less special are the salad (with a particularly synthetic “vinaigrette”) and the steamed-egg custard (good for burning taste buds, but not pleasing them). The service at Roadem was indifferent (particularly for the non-Koreans amongst us). It was as if there were too many tables for the staff on hand, though it clearly was not so. But Roadem’s grilled-meat Korean-barbecue dishes made it well worth these shortcomings. As much as AYCE seems to sum up the worst of American food culture, at Roadem it manages to bring quality Korean barbecue to an accessible price point.